The versatile MoonLit LED Micro Lantern features a secure carabiner at the top allowing it to clip and hang providing ambient hands-free lighting just about anywhere. The bright LED (white or red) can be set to glow or flash, and swivels in place 3600 providing a comprehensive lighting solution in a compact package. Water resistant and featuring replaceable batteries that last over 60 hours, the MoonLit Micro Lantern is a great lighting companion for camping, fishing, reading, clipping to poorly lit areas like closets or shelving, and much more. Illumination has come full circle, literally. Our brilliantly durable NiteHowl LED Safety Necklace is made with a flexible polymer tube, illuminated by two bright red LEDs, that simply slides over your dog's neck for hours of nighttime fun & safety. Just trim the tube to a custom fit, give the button on the durable, weather resistant housing a quick press, and the entire collar lights up a full 360 degrees, making your dog clearly visible from all angles, coming and going. The LEDs can be set to either flash or glow modes - great for differentiating more than one NiteHowl-wearing dog. But, as fun as it is (like a neon necklace for dogs! ), the best thing about the NiteHowl is that it keeps you and your buddy seriously safe on those after-hours walks, romps in the park, and campsite moon-howling sessions. Pet Wash Enclosure with Wheels Dogs title as Mans Best Friend has been around for almost 15,000 years. Currently, dogs are genuinely being treated like mans equal counterpart with their own specific clothes, yummy treats and even doggie hotels. Every dog-owner knows the energy consuming fiasco required with washing these furry pals in our kitchen sinks and bathtubs, along with the mess afterwards. For this reason, we have developed the Home Pet Spa that will not only make our life easier but your dogs more enjoyable. Easy to store in your garage, basement or laundry room, you can now keep your dog clean in the comfort of your own home without worrying about the groomer or the cleanliness of your home. Our unique design offers your dog a relaxing experience in our special dog wash with its strategically positioned jets and massagers, while you give your soapy furry friend the bath he needs with little effort. 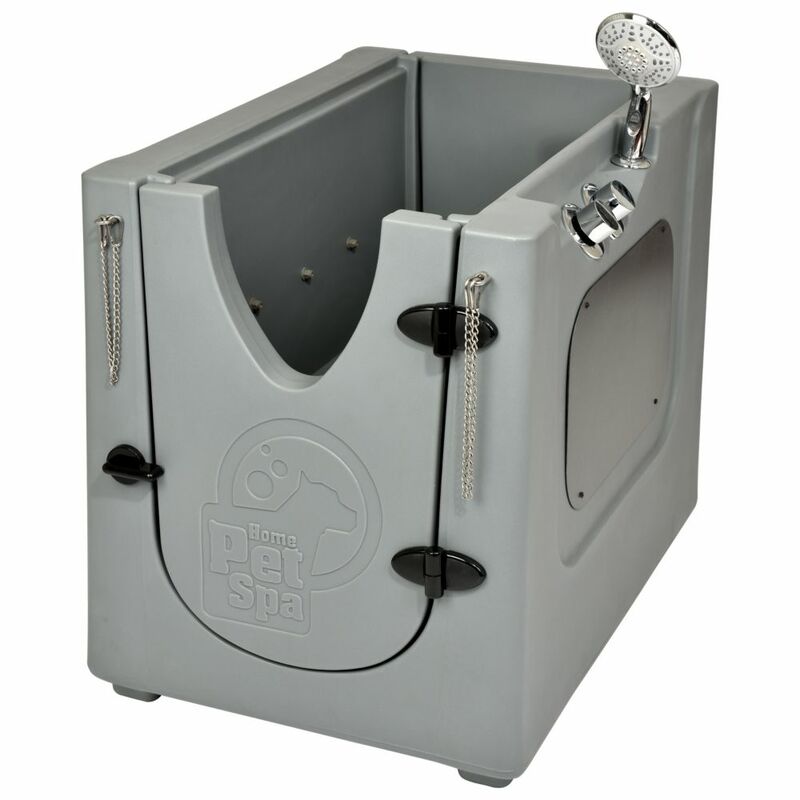 Pet Wash Enclosure with Wheels is rated 3.0 out of 5 by 1. Rated 3 out of 5 by Chuck from Quality of your product needs some improvement. There was a line not connected to a side spray fi... Quality of your product needs some improvement. There was a line not connected to a side spray fitting, not enough treads for the line to secure onto the fitting. The gasket for the floor drain was slightly to large in diameter to seal the drain correctly. However, the wife likes the product, alotg easier to bath the dogs.